Genesis recently introduced its 2nd racquet to the line and we are proud to announce that we now offer it, Intrepid. For those familiar with the high-quality string offerings produced by Genesis should definately try out their racquets! Their first racquet introduced a few years back is the Thunder Power racquet which plays very similar to the Babolat Aero Pro Drive but more similar to the original one as used by Rafael Nadal. It is a one piece construction and plays very solid. For Babolat Aero Pro Drive users, check out the Genesis Thunder Power racquet and you will not be let down! Now as we turn the page to the Genesis Intrepid racquet, our playtest team found this racquet to be very solid as well. Most playtesters found the racquet to play similar to the Babolat Pure Drive, Head Radical, Wilson Blade and other simialr racquets out there on the market today. The racquet has a great blend of power and control and is the ideal racquet for the aggressive baseliner. Genesis’s Toray Carbon Fibers technology provides improved control and feel combined with impressive acceleration. A thinner beam at the throat allows players to swing confidently without the fear of losing ball control. 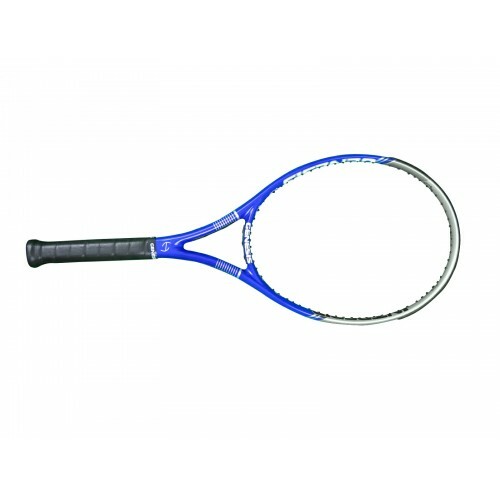 This racquet is perfect for the aggressive baseline player who likes to play with heavy topspin from both groundstrokes. On serve, we found great feedback with loads of power and spin. At net, Intrepid is easy to maneuver and offers nice touch. The large sweetspot offers a crisp feel with exhilirating precision. The racquet is constructed from a single mold from the grip handle to the head of the racquet. This unique construction is what makes the racquet feel so solid which also means less shock to the player. 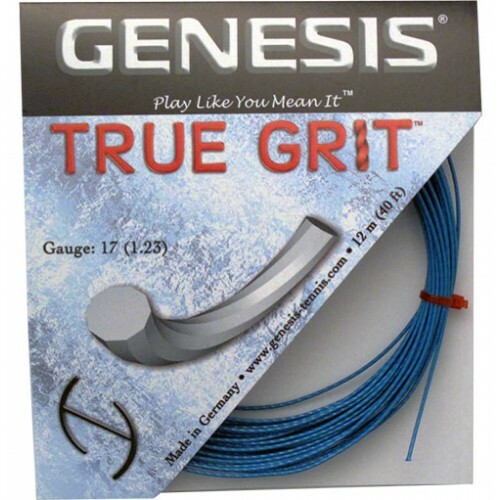 Genesis recently introduced its newest string to its fine line of products, True Grit. Their product description states that True Grit is a further development of premium co-polyester strings offered by Genesis. Utilizing cutting edge technology and new composite additives, True Grit delivers outstanding performance. Genesis True Grit is a 10 sided shaped string that offers exceptional spin, control, comfort, and power. True Grit is also axially twisted and offers a tremendous blend of dynamic power and spin while providing excellent tension stability and playability. Asics recently introduced the Gel Resolution 5 Tennis Shoe which in my opinion is the best tennis shoe on the market today when it comes to comfort. The newest colorways are sure to be hit as we head into the French Open and clay court season. 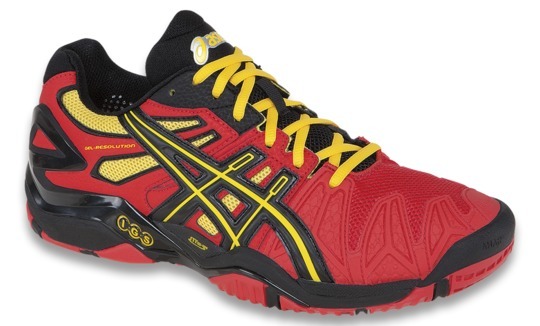 The new Asics Gel Resolution 5 also come with a 6 month warranty so the frequent player is in luck here! The pinnacle of the ASICS stability tennis line, the GEL-Resolution® 5 doesn’t disappoint. The newest edition to this series features an improved Flexion Fit™ upper design providing one-of-kind upper comfort, in addition to a re-designed PGuard™ improving upper flexibility. New to this model, a hidden Trusstic System® has been developed to allow full ground outsole contact all while providing the superb medial stability and torsional rigidity that this series is known for. The best just got better. Have any questions, comments or concern regarding this or other Asics tennis Shoes? ? Then, be sure to let us know today and we will be glad to assist. Q.What guidelines do you suggest for how often players should change their strings? A. There are several factors that come into account when determining how long strings last. Players should change their strings based on the type of string they use, how often they play, whether they have a competitive match coming up and how much tension the string has lost. Many players change strings when they break, but too often the difference between winning a match 7-6 in the third set and losing one may be the strings that are on your racquet. One thing we recommend is cutting out poly-based strings once they go dead and many people wonder how long do strings last before they go “dead”. This varies from player to player, from string to string but typically once a week (6-8 hours of play) for a competitive junior/adult or mid age adult player every 3-4 weeks (18-20 hours) for a recreational player. Once you notice the performance of your string going downhill and you feel like you lost control, put in some new fresh strings. There are many devices to check string tension on your racket. The best one we had found is ERT-300, which accurately provides you with DT, which you can relate to your actual string tension. If you use strings as hybrid, then you are having two opposite worlds. Let’s assume you’re playing with “stiff” poly that has already lost tension and becomes dead and a soft syn gut that loses tension and stretches so much that you’re loosing control more and more with every shot you make. Which string would you blame more? Some of the polyesters, specially from Poly Star are very soft and comfortable and are typically not used in a hybrid due to the rapid tension lost. Q.What has been the biggest change you’ve seen in the market during the last few years and what trends do you see as most important in the near future? A. The string industry has changed dramatically over the past couple of years as poly-based strings have been known for losing tension and being stiff and their point of view has drastically changed for the better in the past few years. With the growth and development of hexagonal, heptagonal, twisted, textured, pentagonal and now triangular strings on the market, there are hundreds of different strings that may possibly take your game to the next level. With the way technology has improved the evolution of strings recently, the future of the string industry will be very interesting, to say the least. All companies are now heading in a direction to produce soft and comfortable polyesters and are seeking ways of offering excellent durability without the loss of feel and comfort. Remember: Strings that lose tension can hurt your joints in the long run so contact us today if you are seeking the proper string your body and game! ASICS America was pleased to announce the signing of two-time National Collegiate Athletic Association (NCAA) singles champion Steve Johnson. Johnson played four years at the University of Southern California (USC) before leaving this past May as one of the most decorated tennis players in college history. While at USC, Johnson led the Trojans to four consecutive NCAA team titles and completed a 72-match winning streak as he defended his NCAA singles title. He is a seven-time Intercollegiate Tennis Association (ITA) All-American and was named the 2011 and 2012 Campbell/ITA National College Player of the Year as well as the 2011 and 2012 Pac-12 Men’s Player of the Year. Johnson, 22 years old, is from Orange, Calif. and began playing tennis at early age with his father. He currently trains with the USTA in Carson, California. Steve is using Asics Resolution 4 shoes. While at USC Steve played with Genesis Black Magic and his last season he played with Polystar Energy 17g in hybrid. His current setup while competing on the ATP World Tour is Baboalt VS Natural Gut and Poly Star Energy. .
Physicians have been recommending Traumeelfor over 50 years as a safe, effective and prescription-free alternative to NSAIDs (non-steroidal anti-inflammatory drugs). This natural medicine is among the most popular homeopathic formulas in Europe today. Traumeel is made up of a combination of 12 botanical substances and 2 mineral substances. Backed by over two dozen scientific and clinical studies, Traumeel has become for millions of people worldwide a trusted therapy for aches and pains and an essential addition to at-home health care. Warnings: For external use only Do not apply Traumeel ointment over large surfaces of the body, over broken skin, burns or directly into open wounds. If symptoms persist or worsen, or if a rash develops, a physician should be consulted. Keep this and all medicines from the reach of children. Side Effects: In rare cases, allergic reactions may develop. The Asics GEL-RESOLUTION 4 has become a leading tennis shoe and has many brands trying to keep up. It boasts rearfoot and forefoot GEL for unsurpassed cushioning and shock absorption DuoTruss and lateral forefoot wraps for excellent support in all directions P Guard toe reinforcements and AHAR+ outsole to provide durability exactly where it is required and a Solyte midsole to make it extremely light. All these technologies and many more combine within the GEL-RESOLUTION 3 to create a shoe that performs at an exceptionally high standard on all surfaces. The Resolution 4 is for tennis players who demand the best that ASICS has to offer. Comes loaded with performance features, including Impact Guidance System (I.G.S.®), Solyte® midsole material, PHF® (Personalized Heel Fit), and PGuard™ toe protector. This third version of the Gel Resolution features the proprietary Flexion Fit upper which provides form-fitting comfort without sacrificing support. The inclusion of an extended trusstic adds torsional rigidity and enhanced medical stability. Asics will offer the men’s version in black and green with silver accents (the black shoelaces even have a green tip), as well as a more traditional white with blue trim. The women’s Gel-Resolution 4 will be available in all white as well as the blue-and-pink cosmetic.